On this blog we have talked about frames quite a lot. I used them in my wedding and for those of you new on the blog, let me tell you…I had the most frugal wedding of all times. So, naturally what I suggest is not going to burn a hole in your pocket. How much do fancy frames cost? Depending upon the place you pick it up from, you can really manage to either burn through all your money or do some serious smart purchases. Any antique store: Rent it out in bulk. Shouldn’t cost you more than 300-400 bucks. I spent 200 bucks to get 15 frames in total for 2 days. Mind you, if you do online shopping for colorful antique frames, it can cost you anywhere from 500 upwards…and that’s just c-r-a-zy-y-y-y. So, don’t buy online. Also, don’t go shopping for antique frames in malls. They look great in the stores…and that’s precisely why they charge a bomb for them. So be smart and find local jugaad. What kind of frames am I talking about? You can may be go for this look during your pre-wedding functions, when there is not too much going on, and the focus can be the creative decor. I personally love the frame + flowers decor for a mehendi function. I think it blends perfectly with our culture and traditions. Its a lot of fun to use the frames as a prewedding photoshoot prop. You can do goofy pictures, some romantic shots and basically anything that you can come up with. If you don’t want to do exotic flowers, just get marigold instead, and trust me, it will be one heck of a decor piece. Looks gorgeous isn’t it. Perfect for an outdoor mehendi event. I think this is an easy one. Almost everyone nowadays is doing a photo booth using frames, and even though you might think its done to death, let me tell you its a ton of fun. Not only is it for you to click pictures for your besties, it adds up as a standalone decor piece as well as something fun for your guests to indulge in. Just some flowers and rustic frames, and you have a gorgeous backdrops all by yourself. It really doesn’t take that much of efforts, requires minimum items – a nylon string, a scissor, some flowers and finally frames. Just get any wedding venue boy to help out, or even better give the supplies to your decorator and get it done through him. It will cost less, and you have a memory of something that is solely your creativity. Remember my post on using a ladder prop almost free of cost? Well, this is the perfect fuss free way to decorate your ladder prop. Its sweet, and you can share so many memories of you, your family, your fiance using this ladder decor prop. One of my favorite options in this list. Look how stunning and innovative this use of frames is. If you have a vintage wedding theme going on, I totally recommend going for something like this in your wedding. The idea is to do both the things separate. Get the frame separately, and the printable separate. Even if it doesn’t fit accurately, a jugaad of sorts will work too. Now, I have said this before…no matter how big your wedding is, you won’t have more than 50 sets of tables…and 50 is like far fetched. I had 500 guests, and I had 20 tables + theatre style seating. So in total you only need to get that many frames. Now a easy way out is to print out pictures and just put a small photo frame in each of the tables. Its gets personalized and your guests even get a conversation point all thanks to your geniusness. How many weddings have you been to with those boring signboards from hotels typing so and so getting married to so and so in this ballroom/auditorium. Its just not cool right? So, if you’re planning ahead of your wedding, may be keep the frame in mind for making a custom signboard for your guests to see right before they enter your wedding venue. Remember the part where I said use frames as center table pieces, well if you have a theatre style seating going on, don’t worry…we have you covered as well. Just tie around some photo frames to each of the rows and it will make for a stunning diy decor at your wedding. The best part, you can totally re-use these photo frames post wedding by making a gallery wall in your new residence. Super simple and cost effective. You don’t need to buy multiple frames, just one big one. The good thing about this decor idea is that you can make this and keep aside well in advance to your wedding. On the day of, somebody just needs to pick it up and put it in the right spot. If you have an outdoor wedding event, this works perfectly with that. Choose a big tree which is standing out in the entire location and use the tree as a prop to deck it up with all things that come budget friendly. Think frames, paper kites, balloons, yarn orbs etc etc. Just go with your decor flow. Just some crystal strings (easily available with the decorator) and some frames + some fairy lights, and ask him to do all the work. It will add another dimension to the otherwise boring standard wedding decor. #16 The main center stage background? You know, nowadays everything is possible. Like anything you dream of, it can be done. Its just that you need to think of what you want the wedding to look like. And then let pinterest tell you how to go about it. Almost 90% of the things can be done economically, you just have to do your homework properly. Just how gorgeous is this setting? 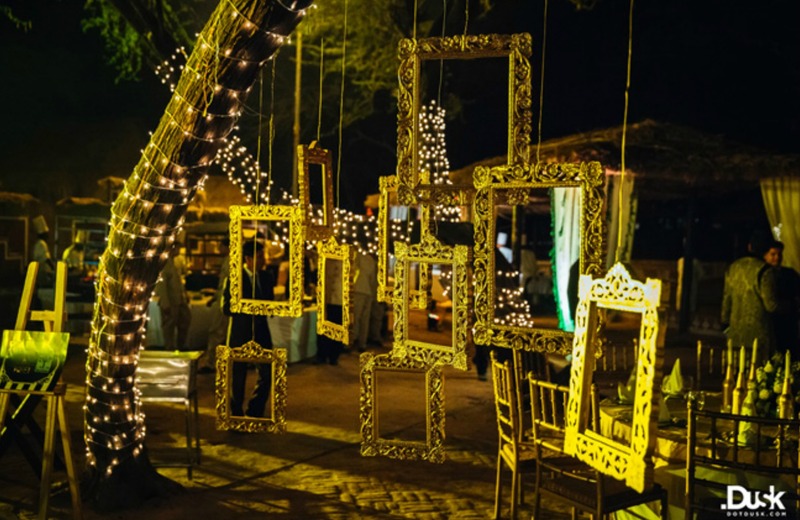 You can get your bride+groom post wedding shots clicked in this kind of a decor style. Its super duper stylish, I just love the couch so much. What about you? Its your first house after your marriage, and may be you don’t have all the world’s money to decorate it right away. But you still want your den to look fabulous and inviting, this could be the perfect jugaadu way to deck up your place and still make it look stunning. I mean why not? Ganesha, and nameplates are like so done to death affairs, if your style is quirky, then go for this one. You don’t need to use fancy exotic flowers all the time…you can pretty much do with twigs and some wild flowers. Or, if that’s too much effort…then just do a nameplate write up yourself and put it within the frame. Gallery walls are so popular these days. If you have a huge wall which is like the focal point of the room, use the wall for such a gallery wall look. You can pretty much add anything to the frames from quotes, to memories or even random pictures. Its all good. Isn’t this gorgeous? You can try putting these up in your balcony wall. Not only will it add to the nature bit, it also is a decor which will never really go out of style. 22 Outfits you cannot miss from JJ Valaya’s AIFWSS17 collection ! where did you rent it out from? I had rented my antique frames from a local kabaadi vaala. We knew him as he collected newspaper stack for years from my place. So I could manage to convince him to lend me most of his broken/antique looking dusty frames for scrap value. I think the deal you got for 15 frames is pretty decent. The price won’t go down below that I am afraid.